Have you ever come face to face with death? I did, once—at a graveyard in the Philippines. 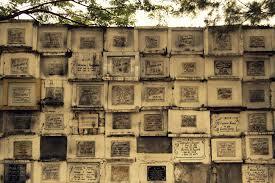 There, the bodies are not buried six feet under, but in cement enclosures above ground. To reach the burial site for the funeral we were attending, we had to walk through a maze of these cement enclosures until we reached the back wall. There, the poor rent slots for their deceased loved ones. Because they can’t afford a permanent resting place, the remains are often tossed on the ground once the rental agreement is complete and the space is needed for a new occupant. While navigating the maze of tombs, it’s not unusual to encounter skeletons with skulls full of withering hair. It’s a sobering encounter with the reality of our own mortality. A walk through life can often feel like a walk through that graveyard—every day surrounded by news of suffering. Even worse is a much-anticipated visit to a place meant to bring hope, only to find a mausoleum of death. It’s beyond unfortunate when a church feels like a mortuary—a place of meaningless ritual, passionless preaching, and meaningless tradition. Really? Is this what Jesus died for? Reflecting on my journey through that maze of death, I realize one glaring truth. No man dies to live among the dead. No man lays down his life so others can live as zombies. And, to be honest, that’s what empty religion can do to a person. We appease our conscience with a weekly (or yearly) visit to church—stand up, sit down, repeat memorized phrases in droning monotone, and leave unchanged. And I must ask again…is THIS what Jesus died for? There is much to be said about what Jesus DID die for. Still, we neglect to consider what he DIDN’T die for. And we can be sure he DIDN’T die so we can show up once a week in a pretty dress or snazzy suit, impressing others with a façade of pious humility. He didn’t die so we can drive up in our sleek sedan, drop a few coins in the bucket, and return after that miserable half-hour to a life of self-indulgence. He didn’t die so we can stand in a room full of strangers, together mindless robots repeating phrases that mean nothing to us. Believe me, NO man would die for THAT. What is it that so moves us to go through the mindless motions, week after week, year after year? Why do we settle for infinitely less than what our Savior died for? Why do we live bound to our comfort zones and safe houses when he left his comfort and security behind to suffer and die that we can have LIFE that is truly LIFE? There’s a vast difference between walking dead while awaiting resurrection, and walking dead unaware, desiring for nothing more. Posted in Faith, Inspiration and tagged Christianity, Church, Death, Easter, Jesus, Purpose, Religion, Resurrection, True Religion, Worth Dying For, Zombies on April 7, 2015 by jenna fernandez. ← Why Do You Look for the Living Among the Dead?